Blu Homes today announced the purchase of the assets of San Francisco-based Modern Cabana, a provider of prefab accessory structures such as yoga studios, home offices, workshops, garden sheds, etc. The acquisition marks the continued growth of Blu Homes in California and shows the company’s commitment to prefab of all shapes and sizes — in this case small, modern spaces that can in some cases go up in a weekend or without a permit. Modern Cabana units will be built in Blu’s Vallejo factory and available for purchase starting in 2013, according to a company statement. Tiny Eco Modern Cabana Now for Sale! Speaking of tiny prefabs, Modern Cabana — the same company behind last year’s Sunset Modern Cottage Idea House — has a 10’x12′ demo cabana for sale. The UC 10×12 model retails from $16,375, but this demonstration version is selling with a 25% discount. 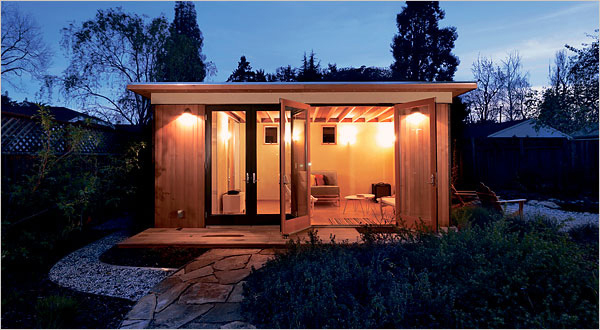 The Modern Cabana includes a french door, clear cedar siding, denim wall insulation, rigid roof insulation, maple interior paneling, and bamboo flooring. If you have a future architect or designer at home, you've probably started them out with spongy building blocks or something. After that, you might move up to the wooden building blocks, and at some point, Legos will likely get a turn. Maybe even a prefab playhouse like this would do the trick? Modern Cabana, the same company that designed and built the Modern Cottage Idea House for Sunset Magazine, recently announced that they're offering this KIDDO Cabana in kit form for $1,500. If you're anywhere near Menlo Park, California this weekend, you should head over to Celebration Weekend held by Sunset Magazine. This year, Sunset is featuring a Modern Cottage built by Modern Cabana as one of the magazine's idea houses. I guess the official name is something like the Sunset Modern Cottage Idea House. Made with two modular living spaces, 300 square feet and 120 square feet, respectively, this MC Studio Home is a striking combination of style, efficiency, and small living.